The sphere in Battery Park last spring. It has to move by this fall for construction. LOWER MANHATTAN — The World Trade Center sphere may be banished to storage for several years while the Port Authority finds it a new home, sources told DNAinfo this week. The Fritz Koenig sculpture, which once anchored the World Trade Center plaza and was damaged but not destroyed on 9/11, is getting kicked out of its temporary home in Battery Park later this year and has nowhere to go. Many 9/11 family members, who see the sphere as a symbol of resilience, had hoped the sculpture would return to the heart of the World Trade Center site. But the Port Authority and the 9/11 memorial foundation have objected, saying that the dented, 25-foot-tall sculpture would be out of place there, said Michael Burke, a 9/11 family member who is leading the charge to bring the sphere back to the site. 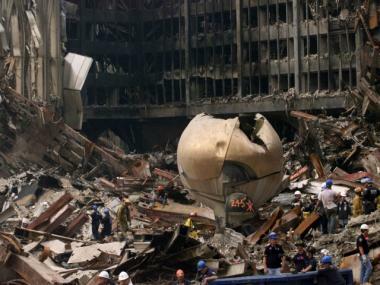 The sphere at Ground Zero, two weeks after 9/11. 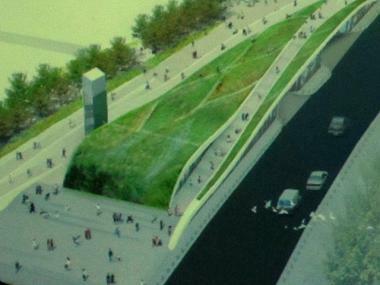 Instead, the Port Authority’s latest idea is to bounce the sphere over to the future Liberty Park, a small, triangular green space south of the 9/11 memorial, Burke and another source said. Liberty Park, though, won’t open until at least 2013, after an underground vehicle security center is built beneath it, leaving a gap of several years when the sphere might have to go into storage, a source familiar with the Port Authority’s position said. In addition to the timing problem, Burke said it makes no sense to permanently install the sculpture so far from its original location. "It’s become an icon because it was in that place," said Burke, whose brother, FDNY Capt. William F. Burke, was killed on 9/11. "Why not put it back where it belongs?" Placing the sculpture in Liberty Park would create the false impression that it sustained damage on 9/11 in that exact location, said Burke, 54, a Riverdale resident. Burke said he has spoken to 9/11 Memorial officials about placing the sphere between the waterfalls in the Twin Towers footprints, but they did not want any 9/11 artifacts on the tree-dotted plaza, Burke said. "You don’t choose design over history and truth," Burke said. "You’re conveying a falsehood by putting [the sphere in Liberty Park]. It robs it of its meaning." Officials at the 9/11 Memorial referred questions to the Port Authority, which did not immediately comment. The Battery Conservancy did not respond to a request for comment. Warrie Price, president of the Battery Conservancy, told DNAinfo late last year that the sphere would have to leave Battery Park by fall 2011, as the long-awaited reconstruction of the park moves into its final phase. The sphere’s potential move to Liberty Park has received some support in the downtown community. "I think it’s a good idea," said Julie Menin, chairwoman of Community Board 1, who added that she heard the move was likely, but that no final decision had been made. "Having it in Liberty Park is a symbol of how we’ve been able to move on." A rendering of Liberty Park, which the Port Authority plans to build on top of the underground vehicle screening center and parking garage. Catherine McVay Hughes, chairwoman of CB1’s World Trade Center Redevelopment Committee, said her biggest concern is that the sphere find a "respectful resting place" somewhere in lower Manhattan. "We feel like the sphere," Hughes said of residents who survived the attack. "We made it through, but we got a little beat up in the process."